With a focus on exploration rather than exposition, So Yong Kim’s Treeless Mountain is a plaintively simple, tender take on childhood vulnerability and isolation. 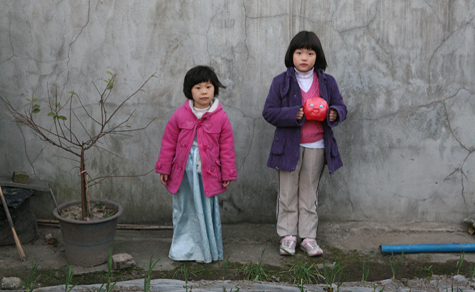 Bin and Jin are two playful young sisters of four and six living in Seoul, South Korea. Deciding to track down their estranged father, their mother leaves them deserted in the unrelenting arms of their Dickensian aunt. Failing to understand their abandonment and new surroundings, the pair rely solely on each other to hope for a better future. Pace-less and Cinéma vérité-esque in style, Treeless Mountain is a captivating viewing experience for the two central performances alone. Played by real life sisters Hee-yeon and Song-hee Kim, these two, untrained young talents do not act out this painful scenario, they experience it. With limited scripted dialogue and a stylistically-light direction style, So Yong Kim let’s the kids control the motion of the film. From skipping through the city to crying each other to sleep, the candid nature of the scenes means the perturbing child neglect subject material is handled with consideration and poise, whilst still being pellucidly heartbreaking. This entry was posted in ★★★★☆ (4) and tagged Korean Cinema, So Yong Kim. Bookmark the permalink.